Photo mosaic maker » directly online & without download! Create your own beautiful photo mosaics with the online photo mosaic maker. 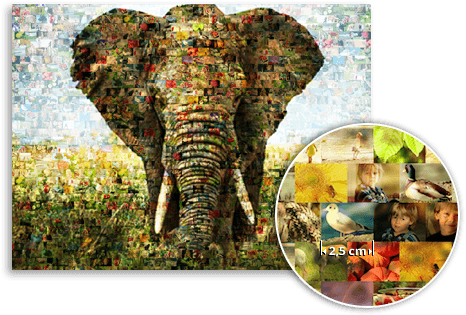 The mosaic photo maker requires no downloading and is simple to use. 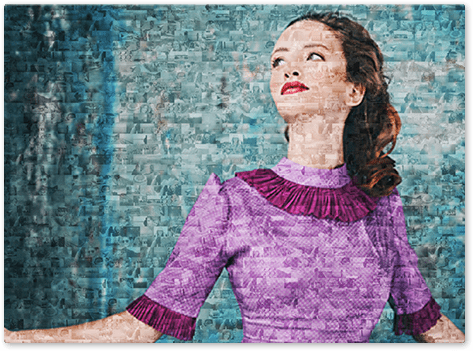 Start creating your picture mosaic immediately by uploading your photos online. The mosaic photo creator makes it easy to produce your own amazing picture from many pictures. Upload your main image into the free mosaic maker – this is the photo shown in large on the final picture. Then upload the smaller photos into the mosaic maker. You can use up to 1000 photos. Now we can start to create your picture from many pictures. This will take around 24 hours. Your preview has arrived! If you are happy with your mosaic, select a material (e.g. canvas). Then you can purchase your finished photo mosaic. Delivery takes 1-3 days.